We ended last night packing for today and then crashed. This morning, we woke up early (5:45), got our stuff together and were on our way to the Maui airport by 6:30. We ate a quick breakfast in the airport and had a pretty painless flight to Hilo on the big island. The scenery from the flight was breathtaking. We were able to check into our hotel early and were even upgraded to a suite for our one night. It's not the most modern hotel, but it's pretty nice. After getting settled in, we drove up to the Hawai'i Volcanoes National Park and toured the Kilauea Caldera Volcano. It was truly amazing. The pictures we took do not do the beauty of the whole area justice. We stopped at the Visitor Center first to get a map and watch a short movie about the origins of Hawaii and its volcanoes. The way the Hawaiian Islands were formed from volcanic eruptions at the ocean floor is a fascinating story. Unfortunately there was the part where Man introduced himself to Hawaii's perfect natural order and disrupted it causing the extinction of many plants and animals that were unique to Hawaii. But I digress. 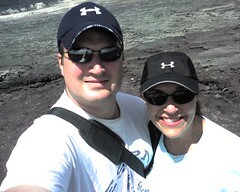 After a quick lunch, we snapped a few pictures and then drove around the Kilauea Crater Rim. We stopped and walked around many of the scenic areas (taking more pictures). There were a couple stops where we could actually walk out to the edge of the crater and look over. It was awesome! At one stop, a couple that used to live in the area in 1959 told us about the lava eruption that spurted like a geiser and turned a whole wooded area to leafless, ashy tree trunks (that grew back over 30 years). We then walked through the "lava tube" which was a natural tube formed in a lava formation. It reminded us both of Luray Caverns. It was possibly a little less than a 1/4 mile long. It was fairly high at some points and just short of 6 feet high at others. After that, we were whipped and headed back to the hotel to get ready for dinner. We went to Pescatore Italian Restaurant in Hilo which Holly had read about in a tour book (or tour website). We started with a 2002 Brolio Chianti Classico. The wine did not set a good tone for the dinner. The waiter broke the cork and handled the situation awkwardly. He handed a tasting to me in my glass and I complained that there was a lot of cork in it. So, he filtered the wine through a napkin into a decanter. I was ready to send the wine back at the faintest flavor of anything bad. But it tasted good. I wish the waiter had just admitted to breaking the cork and brought a new bottle, but it worked out. We followed the wine with garlic bread with tomato and romano cheese. It was awesome. Holly settled in with the shrimp alla alfredo, but I couldn't decide between the seafood ravioli and the ono marsala. I asked the waiter and he said he could give me a half dinner of each, so I went for that. Wow. Individually, I would have been happy with either, but having tasted both, the ravioli was downright amazing. For dessert, Holly got a chocolate truffle cake but also wanted the strawberries amaretto. So, along with my Disarrono on the rocks, I got the strawberries so she could at least taste both. After a rough beginning, dinner was a wild success. We're both stuffed and ready for bed.